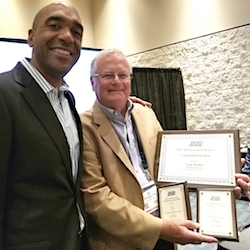 Steve Ferguson, Sandra Palmer, Nancy Scranton and Dave Harner are Legends Hall of Famers now. FRENCH LICK, Ind. 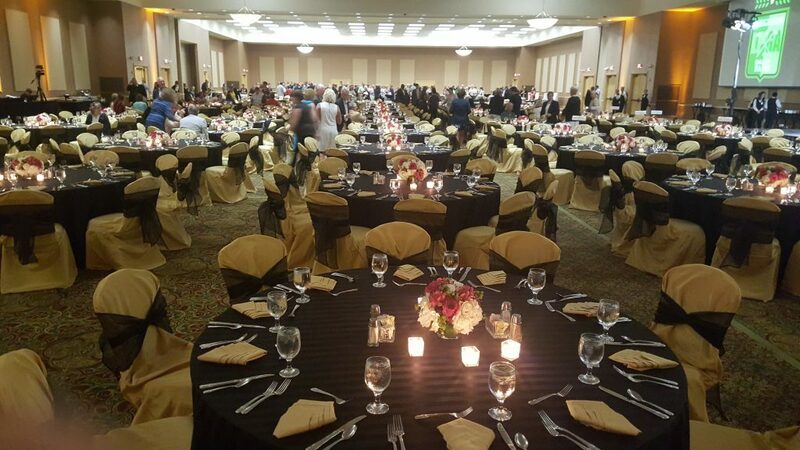 – The Legends Hall of Fame inductions had been a seasonal highlight at French Lick Resort the last four years, but none of the previous celebrations was like the event staged on Saturday night in the Hoosier Ballroom of the hotel’s Event Center. According to script the induction was to honor two more top players – Sandra Palmer and Nancy Scranton. When the emotional night was over, however, the Hall of Fame – located in the nearby West Baden Springs Hotel – had four new members instead of two including the first men accorded the honor. Joe Vezzoso, vice president of resort operations, also welcomed Steve Ferguson, chairman of Cook Group, and Dave Harner, French Lick’s director of golf, to the Hall – a tribute to their leadership in creating the first Senior LPGA Championship, which tees off on Monday on the resort’s Pete Dye Course. Vezzoso also unveiled what is certain to be recognized as one of the most impressive trophies in all of sports. 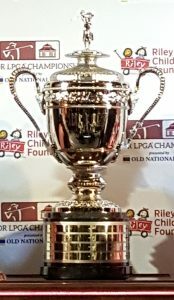 Dubbed “The Fergie’’ in Ferguson’s honor, the trophy will honor the champions of the Senior LPGA Championship and reside at French Lick. The winner will take home a smaller version. Among those in attendance at the rousing gathering were golf architecture’s power couple, Pete and Alice Dye, and Suzy Whaley, who will become the first female president of the PGA of America in 2018. Whaley will play in the three-day 54-hole tournament on a sponsor’s exemption. “The Fergie” is sure to become one of sport’s most impressive trophies. 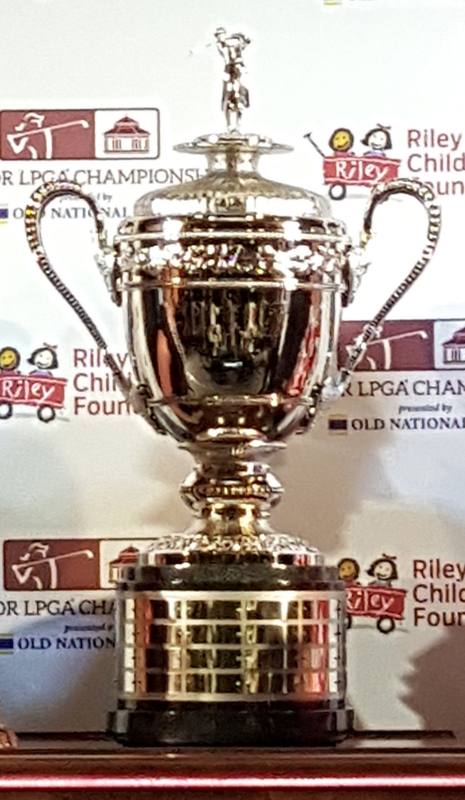 Ferguson and Harner were instrumental in bringing the LPGA Legends Tour to French Lick in 2013, and Ferguson was taken aback with the trophy named in his honor. “I can’t tell you how overwhelmed I am. I don’t feel I deserve this,’’ said Ferguson before the enthused attendees gave him a rousing ovation to assure him that he was. Ferguson in turn put the focus on the $600,000 tournament that will receive three days of live television coverage on The Golf Channel. That represents the first TV coverage of the women’s tournaments at French Lick. Palmer and Scranton both lauded the French Lick staff and Legends Tour for the creation of the upcoming big event. Palmer pointed out the big events that have already been played on the resort’s Donald Ross Course. 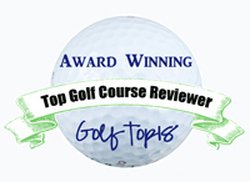 It hosted LPGA events in 1958-60, the last two being a major – the LPGA Championship. Both players also looked back fondly on their starts in tournament golf. For Palmer it came in 1964 when she left her home in Texas in a car by herself for her second professional tournament in Baltimore. She went on to a star-studded career from there, the highlight of which was a victory in the U.S. Women’s Open. “I’m just as excited about golf now as I was then,’’ she admitted. Scranton got her start as a teen-ager in Centralia , Ill. She went on to win three LPGA tournaments, one of them a major, and leads Legends players with five wins on that circuit. She thanked French Lick for creating a Hall of Fame for the 45-and-over circuit. 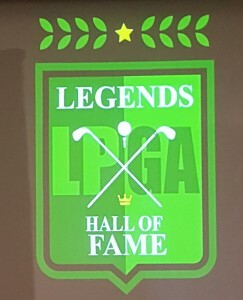 Scranton, who combines her Legends tournaments with the demands of being the mother of 12-year old twins, credited fellow Legends Hall of Famer Nancy Lopez fot getting her serious about golf. “I didn’t get interested until I was 15 or 16,’’ said Scranton, who received a set of clubs as a birthday present when she turned 8 years old but wasn’t excited about that gift. At 19 Scranton qualified for The Rail Championship, an LPGA stop in Springfield, Ill. 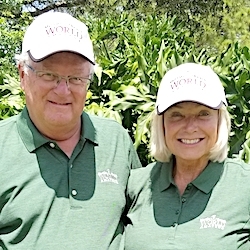 Her father was her caddie and a friendship with Joanne Carner, another Legends Hall of Famer, started that week with some tips on the practice range. 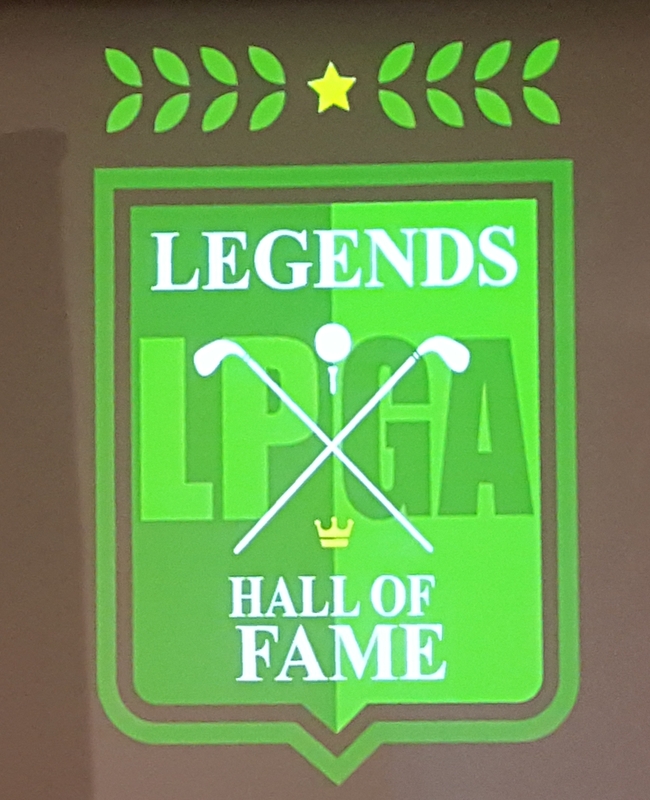 The induction ceremonies led into heat of the competition in the unprecedented six straight days of tournament golf in progress at French Lick. The Symetra Tour’s Donald Ross Centennial Championship concludes on Sunday and so does the Honors Division of the Senior LPGA Championship, which will be played along with the LPGA qualifying tour’s event. Both the $200,000 Symetra event and Senior LPGA Championship will be played at French Lick for the next five years. The Hoosier Ballroom was the site of the biggest Hall of Fame induction ceremonies yet.